Surprise talents, my family has a lot of them. My husband impresses me constantly with them. He can seem so serious that it would take most people completely surprise to find out that he can juggle and was a yoyo champion when he was young. My dad seems anything but silly, but used to wake me up with the most annoying song ever that he made up. "Wake up wake up you sleepyhead, get up, get up, get out of bed, wipe your eye out with a sock!" Green Giant has a giant surprise talent too. The name that makes you think of frozen and canned vegetables also makes chips!! 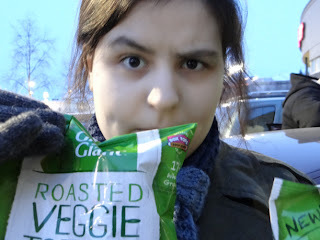 Crunchy, yummy chips with veggies in them and a lot of whole grain and fiber goodness. 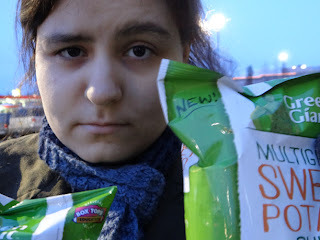 I got to try the Green Giant™ Roasted Veggie Tortilla Chips and the Green Giant™ Multigrain Sweet Potato Chips – Sea Salt Flavor. My husband and I, and our two children are all left-handed, but the graphics that I post on this site are all drawn with my right hand. So that's my surprise talent! The rest of my family has one that I can't do. They can all raise just one eyebrow. I've spent hours making funny faces at myself in the mirror trying to do it, and just can't do it all. But for them, it's easy, and for my daughter, it's two different looks depending on which brow she raises. This looks doubtful doesn't it? She's not doubtful about the chips, it's just her raising that brow on demand. Green Giant™ Multigrain Sweet Potato Chips – Sea Salt Flavor are so delicious. Crisp, delicious and lower fat than regular potato chips (40% less fat!). I love these so much and think they would be just amazing on a Southern style macaroni and cheese. If they last until dinner time. They are so good. 14 grams of whole grains per serving. The other brow, her serious and making a point brow. Green Giant™ Roasted Veggie Tortilla Chips have all natural flavors, and the flavor is cheesy. Not the super, salty actually kind of gross cheesy flavor of a lot of corn chips, but a really wonderful cheddar taste that gets a bit of a salsa kick from the peppers and other vegetables in the chip. My husband said "These are pretty doggone tasty!" (yes, he said doggone, yes, I was absolutely charmed by it.) 17 grams of whole grains per serving. Want to see lots of great surprise talents collected by Green Giant and learn more about these great new chips? Check out Green Giant's YouTube page and see the surprise talents they found. You can also like Green Giant on Facebook and upload a video of your own surprise talent!